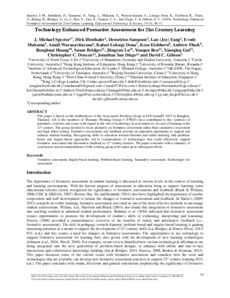 This paper is based on the deliberations of the Assessment Working Group at EDUsummIT 2015 in Bangkok, Thailand. All of the members of Thematic Working Group 5 (TWG5) have contributed to this synthesis of potentials, concerns and issues with regard to the role of technology in assessment as, for and of learning in the 21st century. The group decided to focus primarily on formative assessment rather than summative assessment and high stakes testing. Formative assessments and feedback provide an important opportunity to support and enhance student learning. Recognizing shifts in education towards blended and online learning with problem-based and inquiry-based approaches led to considerations of technologies that could effectively support formative assessment and informative feedback to 21st century learners. The paper concludes with a summary of conclusions and recommendations of the working group to be taken up in subsequent efforts.